On July 25th, 1909, Louis Bleriot stunned the world by using an airplane to cross the English Channel. He had piloted his Bleriot XI aircraft across the 21 miles of water from France to England in 37 minutes, landing near Dover castle. Bleriot had made the dangerous trip to win a �1,000 prize offered by the Daily Mail. Four years later, Lord Northcliffe, who owned the Daily Mail, made another challenge: �10,000 to the first men to fly the Atlantic from North America to Ireland or England in less than 72 hours. This was distance of over one-hundred times greater than that of the Channel flight and incalculably more dangerous. The challenge lay unaccepted until 1919 and the close of WW I. Aviation technology had advanced rapidly during the war, but it was still only a mere sixteen years after the Wright Brothers had made their famous flight at Kitty Hawk. The first successful attempt to cross the Atlantic by plane was made in May of 1919. The United States Navy had seen a need during the war for an aircraft with enough range and bomb/depth charge capacity to guard ships in the Atlantic against attack from German submarines. Four of these planes were built by Curtiss aircraft and given the designation NC (for Navy/Curtiss). The "Nancies," as they were nicknamed, were designed as flying boats and could land and take off on the water. When the war ended, the Nancies lost their original mission, but the U.S. Navy decided to use the planes in an attempt to make the first transatlantic crossing. 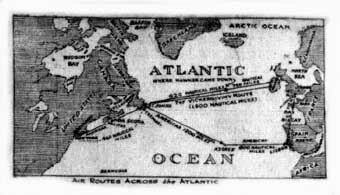 The planes would fly from Trepassey Bay, Newfoundland, Canada, to the Azores Island in the Atlantic, then onto Portugal and England. Such a nonstop flight would not qualify the planes for Lord Northcliffe's prize, but would still be an aviation first as it would require flying over 1,300 miles of ocean, something that had never been done before. Although four Nancies had been built, only three would attempt the crossing. NC-2, which had been flying poorly, was cannibalized for spare parts to repair NC-1 and NC-4. The Nancies were also altered by adding a fourth engine behind the plane's center engine that would "push" the aircraft while the other engines "pulled." It was decided a crew of six would be used on each plane: a commander, two pilots, a pilot-engineer, a radio operator, and an engineer. 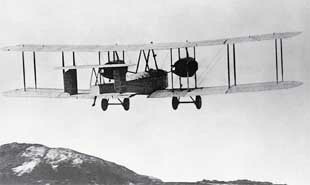 The three planes started for Halifax, Nova Scotia, where they would refuel before going onto Newfoundland, the jumping off point for the first leg of the Atlantic crossing. During the flight NC-4, which was getting a reputation for being a "jinx" plane, was forced to land at sea when two of its engines failed. The two remaining planes went on to Halifax while NC-4 spent the whole night taxiing on its remaining engines to the Naval Air Station at Chatham, Massachusetts. After repairs were made the next day NC-4 flew on. During most of the trip to Halifax, NC-4's engines ran roughly and more repairs were required when the aircraft landed. The next day the plane tried to fly onto Newfoundland, but was forced to land and clear a plugged fuel line before continuing. Meanwhile the commander of the crossing attempt, John Towers, had decided to start the flight without the troublesome NC-4. As NC-4 prepared to land at Trespassey Bay, NC-1 and NC-3 were trying to take off. NC-4 would have been left behind, except that NC-1 and 3 had been accidentally overloaded with fuel and couldn't get into the air. The flight was rescheduled to leave the next day which was May 16th, 1919. The Commander of NC-4, Albert Read, used the extra time to have a new engine and three new propellers installed on his plane in an attempt to resolve the aircraft's mechanical problems. All three planes left Trepassey Bay that afternoon, but only after NC-3 left one of its engineers ashore to lighten the load. It had been planned that the planes would fly in formation for the trip, but this proved difficult. NC-3's lights had been shorted out by sea water on takeoff and was running dark. In addition clouds were obscuring the moonlight and NC-4 had a tendency to outrun the other planes. These factor led to a near midair collision as the unlighted NC-3 found itself sandwiched between NC-4 below and NC-1 above. Fortunately NC-4 spotted the darkened plane by moonlight and veered away giving NC-3 room to maneuver away from NC-1. US Navy ships had been stationed along the route at intervals of 50 miles. They were to fire signals shell and point searchlights up into the air to help guide the planes on their way. Rain and fog soon obscured the ships and lights below. The weather also made getting a navigation fix from the stars above difficult too. At one point NC-4, while trying to get a glimpse of the sea below, fell into a spin and nearly crashed into the water. Finally the fog lifted and Commander Read could see the coast of Flores, one of the western islands in the Azores chain. Because of bad weather he decided to land his plane there at the harbor of Horta, some two hundred miles short of the original destination. NC-1 and NC-3 didn't fair as well. Both attempted to land on the sea and await clear weather, but were damaged and could not take off again. The crew was rescued from NC-1 by a Greek ship, but plane had to be sunk in order for it to avoid becoming a danger to shipping. NC-3 managed to work its way into the harbor at Ponta Delgada by the morning of May 19th, but the plane, missing most of its left wing, would never fly again. Ironically the "jinx" plane, NC-4, was the only one of the Nancies to complete the planned flight. It met NC-3 when it flew into Ponta Delgada on May 20th. On May 27th it flew on to Portugal and on May 31st continued on to Plymouth, England. 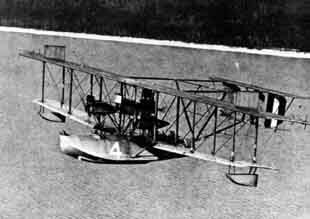 In nineteen days it had traveled 3,322 miles and was the first plane to cross the Atlantic. While the Nancies were making their historic flight across the sea, pilots and planes were assembling in Newfoundland to compete for the Daily Mail's prize for a nonstop flight. The difficulty of the Nancies trip underscored the danger they faced. Of the three planes that had made the attempt, only one succeeded. The other two wound up in the sea. The longest nonstop distance traveled by NC-4 was 1,200 miles. The contenders for the Daily Mail prize would have to fly over 1,800 miles without landing. 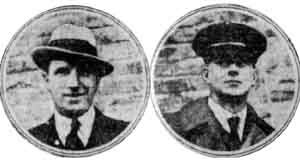 John Alcock (left) and Arthur Brown (right) made the first nonstop crossing of the Atlantic. There had been nine contenders for the Daily Mail's prize, but only four of those actually made it to Newfoundland. Sopwith's Atlantic and Martinsyde's Raymor were perhaps the favorites to make the first crossing followed by a plane from the aircraft manufacturer Handley Page. The dark horse in the race was a modified WW I bomber called a "Vimy" which was built and sponsored by the British firm Vickers. As late as March, 1919, Vickers hadn't even entered in the competition. It was only after a young, former war pilot named John Alcock had came to the company and persuaded them to enter the race (and let him pilot the craft) that work on the modified Vimy began. Two 360-horsepower Rolls Royce engines were mounted on the plane to drive it along at speeds of 90 miles per hour and give it a range of 2,440 miles. Two seats were installed in the cockpit in tandem (next to each other) for the two-man crew: a pilot and a navigator. Alcock would be the pilot, but who would navigate? Alcock was ready to risk a solo flight, but fortunately another war veteran, Arthur Brown, arrived at Vickers in March looking for a job. During the interview Brown mentioned his skill in navigation and how he had planned a transatlantic fight route while he was a POW in Germany. He was promptly introduced to Alcock and offered the job as navigator. He accepted and the two men quickly became good friends. It was easy to compare and contrast the men. Alcock, outgoing, was usually dressed in rumpled overalls and a gaudy jacket, while Brown was a shy, neat dresser, usually wearing a tie and gloves. Both had served in the RFC during the war and had their aircraft downed. Both had been prisoners of war. Both dreamed of being the first to fly the Atlantic. The Vimy was built, tested, dismantled and shipped to Newfoundland in short order. Meanwhile, other competitors were already in Canada getting ready for their attempts by clearing airfields and testing their aircraft. 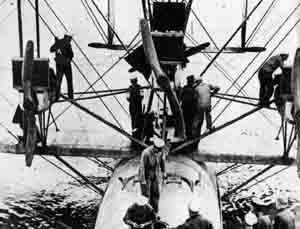 Only bad weather and soggy conditions prevented the Atlantic and the Raymor from taking off before the Vickers team even arrived on May 13th, 1919. The first problem they had to solve was the lack of a suitable airfield. Alcock and Brown spent days traveling the muddy roads in the area in a borrowed Buick looking for a flat, long patch of land they could use to launch their aircraft. On May 18th, the Atlantic rolled down its makeshift runway and staggered into the air to attempt the ocean crossing. The plane traveled 1,400 miles before one of the engines overheated and forced the crew to ditch at sea. Fortunately, winds had blown them 150 miles off course and into the shipping lanes where they were picked up by the Danish ship Mary. One hour after the Atlantic took to the skies, the Raymor lumbered down its field. Overloaded, the plane climbed into the air, but was suddenly caught by a crosswind and dove into the ground. The pilot and navigator were injured, but both survived. With the only other entry, the Handley Page, experiencing mechanical problems, it seemed like the darkhorse, the Vickers team, was now in the lead. As unfortunate as the crash of the Raymor had been, it was a break for Alcock and Brown. The Raymor crew, now out of the race, lent their field to Vickers for preparing and testing the Vimy. The field was not long enough, however, for the Vimy to take off fully loaded so the search for a suitable field continued. A location was found in June, just outside the city of St. John's. Before the field was usable, the location would have to be cleared of boulders, a stone wall and a few trees. Soon the field was ready and the plane in position, but bad weather in the form of a near gale force wind and problems with contaminated fuel delayed the start. Vickers officials, enjoying a mild spring back in England, impatiently telegraphed, "Please cable reason for non-start!" The Vimy might have started its historic trip on June 13th had it not have been for a broken shock absorber and heavy winds. The weather improved the next day and tail winds were predicted all the way to Ireland. The wind on the airfield was blowing from the west, however, which meant the Vimy would have to take off going uphill, an added complication since the plane would be so heavily loaded with fuel. Spectators crowded the field as sandwiches, coffee, chocolate, whiskey and a few bottles of beer were packed into the Vimy. Brown and Alcock climbed into the cockpit were they were seated side-by-side. Between them sat a big battery that would power their electrically-heated flying suits. While a ground crew held the plane back, Alcock revved up the engines. Suddenly the plane was released and slowly it started moving uphill. Alcock had 1,200 feet to get the plane into the air before the field ended in a stone wall. Beyond that was a low hill with trees. "Depressingly slowly the Vimy taxied toward a dark pine forest at the end of the airfield," Brown recalled later. "The echo of the roaring motors must have struck quite hard against the hills around St. John's. Almost at the last second Alcock gained height. We were only inches above the top of the trees." The Vimy climbed into the air with only 300 feet of runway left. It cleared the hill, then disappeared behind it and the crowd thought the plane had crashed. They cheered with excitement as the aircraft turned and reappeared roaring overhead, now going east toward Ireland. It was just after 1 P.M. local time. Alcock and Brown found it hard to communicate once airborn. The engine noise, even at half-throttle, made talking difficult. Alcock found the Vimy a handful to control and was glad he had not attempted the flight alone. Brown kept himself busy checking the engine dials and gauges as well as using his sextant to "shoot" sun and calculate their position. Brown had clear view of it for the first hour, but then the Vimy found itself in a thick fog and Brown had to navigate by dead reckoning. Soon other problems began to arise. A small propeller designed to drive a generator and provide power for the transmitter had broken off. The plane had been silenced. At 6 P.M. GMT they had traveled an estimated 200 miles and Alcock decided to try and climb above the clouds so that Brown could confirm their position with the sextant. Suddenly there was a noise that sounded like machine gun fire. The exhaust pipe on the left engine split open and melted away. Flames were now shooting out from the cylinders and the sound was deafening. The two flyers were scared stiff. Fortunately none of the fire which streamed back from the engine touched the flammable struts, or wing fabric. The flight would continue. After 4 hours of flight the Vimy broke through the mist at an altitude of 6,000 feet, long enough for Brown to "shoot" the sun, which was now nearly set. According to the reading they were exactly on course. As darkness fell the cold increased and they discovered that the battery that was supposed to power their heated suits had failed. "We froze like young puppies," Alcock recalled later, "and in the narrow cockpit we had no room to move about. At any rate," he added, "Brown did manage to get some movement later . . . "
They had been flying eight hours by midnight. The clouds cleared and Brown used the stars to get a fix on their position: 977 miles from Newfoundland. They were past the halfway point. There would be no turning back. The two ate sandwiches, chocolate and drank coffee with a little whiskey mixed into it. The trip was uneventful for another three hours. Then the Vimy found itself in a storm cloud. Rain and hail hit the plane while lightning flashed all around. The Vimy was thrown about by the wind then forced into a stall. When the plane came out of the stall it plunged downward in a wild spiral toward the sea 4,000 feet below. Alcock tried to pull out, but the controls did not respond. Suddenly they were out of the cloud only one hundred feet above the water. With shock Alcock realized the plane was flying on its side with one wing pointing to the ocean and the other back up at the clouds. Alcock snapped the plane back into its proper flying position, but not before they had come so close to the ocean that the lower wings were covered with salt spray. Alcock got the plane under control and brought it back on course leaving the storm behind, but it wasn't long before they were back in another one. The new storm was even more dangerous than the last. Snow, sleet and ice covered the plane. Alcock took the plane up to 9,000 feet hoping to find the sun and melt the ice covering the aircraft. Before that could happen the Vimy's engines began to sputter and lose power. Snow and ice were clogging the engine's air intakes and making it impossible to see the critical fuel guage. If something wasn't done fast the engines would soon fail and the plane would go crashing into the sea. A map from the New York Herald comparing the routes used by Alcock and Brown (top) and NC-4 (bottom). While Alcock continued to fly the plane, Brown climbed out of the open cockpit and onto the wing. He slowly worked his way out toward the port engine which was still spitting fire out of the exposed exhaust ports. While clinging to a wing strut with one hand, Brown chipped at the ice covering fuel gauges with a jackknife. The near one-hundred mile per hour wind tore at him as he stood on the slippery wing surface, nearly toppling him into the black, freezing Atlantic thousands of feet below. With the gauges cleaned, he next worked to clear the intake port. It was a difficult job since he had to avoid the deadly whirling propeller blades just inches in front of the engine and the flames pouring out the ports. When he was finally done, he worked his way back to the fuselage and then over to the starboard wing where he performed the same operation on the other engine. Finally he climbed back into the cockpit for a well-deserved, but short break. He would have to perform the same feat four more times in the next hour before the Vimy cleared the storm. The two exhausted men finally broke out of the storm at 7:20 AM and saw the sun for the first time in hours. Brown took a fix and estimated they were within an hour of seeing Ireland. Fifteen hours of flight and 1,800 miles of open sea lay behind them. The ordeal seemed almost over. Alcock started a decent from 11,000 feet when ice started to interfere with the starboard engine's radiator and the plane's controls. Alcock continued to descend into the clouds, hoping warmer air near the ocean might melt the ice. It did, but as they dropped though the fog they feared that their altimeter was inaccurate and they might hit the ocean. At 500 feet the clouds suddenly ended and the Vimy leveled out, flying at 200 feet. They were making a breakfast of the remaining food when they spotted two tiny islands ahead. Behind them stood mountains with their peaks hidden by clouds. They were approaching Ireland. Brown identified the town of Clifden by the masts of a Marconi wireless station. At 8:25 they crossed the coastline. Having completed their transatlantic/nonstop goal they decided to land in Ireland rather than risk going over the mountains in the clouds to get to England. The Vimy buzzed the town, its noisy engines startling some of the residents. The flyers found what looked like an open field and made a landing, only to find too late that it was a swampy bog. The plane splashed into the mud and came to rest with its nose in the bog and its tail in the air, but the flight was over and had proved successful. A townsman by the name of Taylor was the first to reach the plane and asked, "Anybody hurt?" Brown and Alcock jumped out of the plane and were greeted by over a hundred excited townspeople who took them to the wireless station where their success was reported around the world. The Atlantic had finally been conquered and the Daily Mail's �10,000 prize won. Copyright 2001Lee Krystek. All Rights Reserved.